Rig is an FT1000-MP and using a USB to Serial therefore the device is /dev/ttyUSB0. The serial parameters are correct. The port default is 4532. The program is not communicating with the radio. What am I missing here? 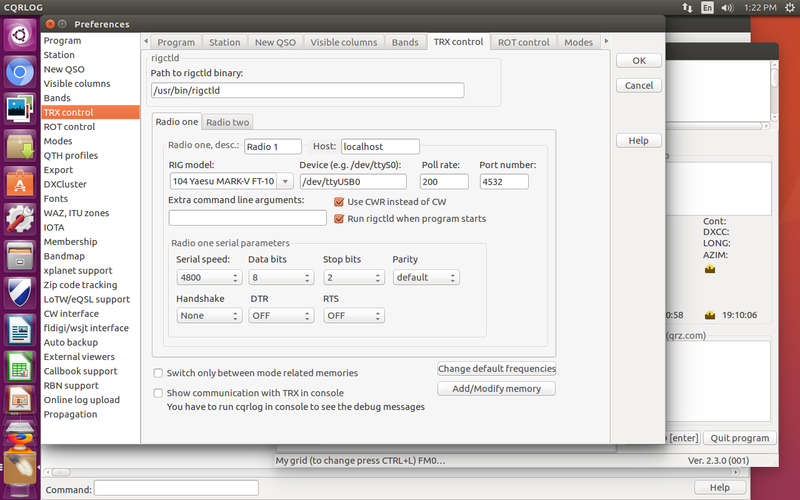 No idea how to check the Ubuntu 16.04 port the radio is actually connected to in Settings. CQRLOG was downloaded from Petr's PPA. New to Linux how do I check the port and if the drivers are working for the usb/serial? devname="$(udevadm info -q name -p $syspath)"
eval "$(udevadm info -q property --export -p $syspath)"
The device USB0 is listed properly but still no work. You suggest what else I may check? Do you have checked the option 'Run rigctld when program starts' in Preferences -> TRX Control? Ordered a FTDI chip cable. Be here Wednesday and yes the "run rigctld on startup" is checked. Ran the ps aux command and rigctld is NOT running. to delete the configuration file. I then and now have an error window stating "Access Violation. Press OK to ignore and risk data corruption. Press Cancel to kill the program." Disregard my previous reply. Not sure what happened but some aspects of it are not there. Access violation. Press OK to ignore and risk data corruption. Press Cancel to kill the program. Uninstalled and reinstalled. 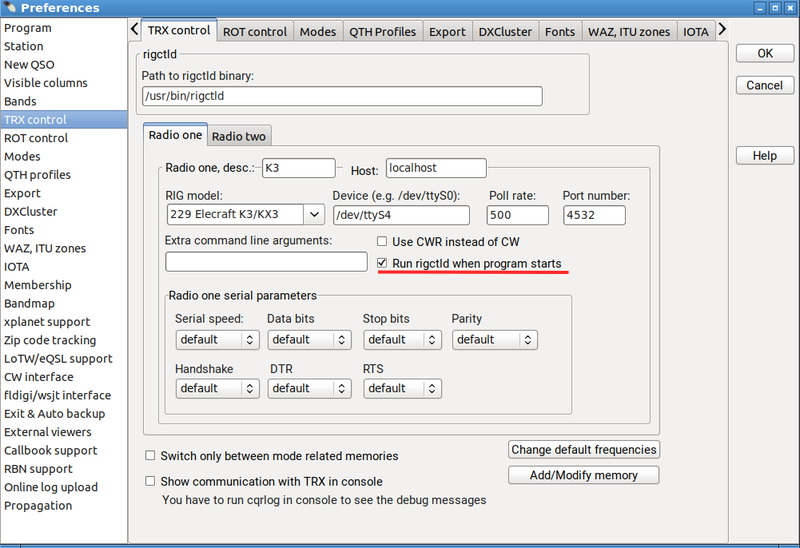 CQRLOG is now running dxcluster, qso window, but still no rigctrld. to check missing parts. I suggest to place the result here. Remember to check the option 'Run rigctld when program starts' in Preferences->TRX control. ps aux shows no rigctld. ldd rigctld to check for missing parts. The option Run righctld when program starts in Preferences>TRX control is checked. ps aux shows all running processes. We need to test that rigctld is there and is able to run. rigctld is a daemon (a process running in the background) and shows no terminal output if is run in so simple way. To verify that rigctld can be run you need another terminal instance (ie. you will have TWO terminals running simultaneously). Open the terminal again and run ps aux. rigctld must be there as the attached image shows. This will verify if your rigctld is functional. In the next step we will investigate why rigctld does not start up if you start CQRlog and the appropriate option in Preferences is checked. I do not know how to run a second Terminal while the first is open. Sorry for my inexperience in basic Linux. Ok Martin. Opened a second terminal and ran ps aux and rigctld is NOT there. Typing that command into the terminal the cursor blinks and nothing more. I am not a member of the dialout group. Never heard of it. you MUST be a member of dialout group to have access to ports! your name must be listed. What option do I put at the prompt Martin? your preferences looking OK, you are also member of dialout - OK.
Start up CQRlog from terminal. I would recommend to use Midnight Commander (mc) which can save you a lot of typing. So, I would navigate to /usr/bin/cqrlog and ENTER. Now CQRlog runs from there. Open the terminal again (new instance) and type ps aux. Check if rigctld runs, provide possibly a screenshot of this terminal instance. Using the ps aux command in another terminal resulted in this. There is no rigctld file. Be sure to select right rig type. if it does not start check previous command what is the complete path for rigctl and use that instead. It should start rigctl in terminal mode (not daemon as it has command rigctld). "vvvvv"s make it very verbose telling what happens. Then give letter f and enter. You should get current rig frquency. giving q enter stops the rigctl and you get command prompt back. Any suggestions? New USB to Serial FTDI. Works on Windows 7 with another logging program to verify. You are not in dialup group, or that group does not have rights to access /dev/ttyUSB0. If your username is in line with dialout, and on second try you get "root,dialout" it should work. Assume there is problem in one. When I open the Terminal this is the prompt. As you see in message #29 you are not in dialup group. Thank you Martin and Saku. Thank you Martin and Saku. This has been and will continue to be a great learning experience for me. At times it was frustrating but thanks to the both of you much knowledge has been gained not only about this fine program but Linux in general. As I turn the vfo dial cqrlog's qso frequency window now tracks but have an issue clicking on a spot in the dx cluster window. The call is entered but the mode and frequency takes anywhere from 2-5 minutes for the to change and many times an inaccurate call and frequency results. Polling is set to 500. Nice to hear your progress with linux and cqrlog. - drop the pollrate. 500ms might be to fast if your rig uses 4800baud as Martin suspected. Try with 1000 or 1500 (1-1,5sec) it is still fast enough. If that does not help you have to dig out why rig does not move. Long time, as you said 2-5min (!!! ), looks like communication error between rig and rigctld that would explain wrong frequency (but not wrong callsign). To find the reason drop the poll rate (just for testing period) to 5000. Then uncheck "Run rigctld at program start" . Copy the text from line having "rigctld" starting from point /usr/bin/rigctld till the end. Paste it to text editor for later use. To be sure that rigctld is closed. If it still running you see it like before. If there is no line like that, it is not running any more. Good. And check that rigctld died using the first command again. If killall does not work you can pick the number at the beginning of that "rigctld" line. It is a process ID number. Again check that rigctld now is gone. When it finally is gone, give the same command and parameters (copy/paste from your text editor) but add one parameter more at the end. Now rigctld should run in your console window. Start cqrlog now. As you unchecked "run rigctld at program start" cqrlog will not start another rigctld, but uses this one running in you console. When cqrlog is up you will see from console what happens when it polls rig on every 5000 (5sec). At that point double click DXcluster line to make your TX move to DX's frequency. Look what happens at console window. Any errors seen then??? You can scroll console lines, and also kill rigctld with Ctrl+C to stop polling fill up then console window. If you kill rigctld like that you can restart it using "arrow up" key that brings you the last typed command and pressing enter after that. How ever cqrlog does not work after that until you use NewQSO/File/Refresh TRX/ROT control. When you have finished with testing remember to return poll rate and "Run rigctld at program start" from Preferences/TRXcontrol. I dropped the poll rate to 1500 and that corrected the issue. All is working well now. Next week I am going to read and reread back over this entire series of replies and redo the commands to learn from this. This is great insight into the inner workings of Linux and cqrlog. Again Thank you Saku and Martin. Now I have a similar problem to John. I had everything working with a fresh install on Linux Mint 18.3. I had the radio and PC talking and I could read the radio frequency in CQRLog. Then I tried installing fldigi using Package Manager. I was able to install the program but could not get it to talk to the radio, no matter what I tried. 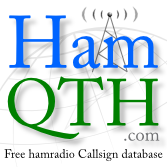 I quit out of fldigi and decided to run CQRLog and get on the air to make a few contacts. To my sadness, now CQRLog won't read the radio frequency anymore. I use a generic serial/parallel port card plugged into a pci slot on the motherboard. From there, that serial cable plugs into my Yaseu (MFJ) radio interface. It has worked perfectly for years. No issues running it under Windows-7 with N1MM Logger either. Running ps aux - it looks like proper operation of ttyS4. I tried all the things you mentioned above and nothing worked. I am a member of the dialout group. rig_open: error = Communication timed out. That must be where the problem is located - but how to correct it... I have no idea. Also, on a separate note: I can't get hamlib to work either. When you are sure no other program is running using serial port in question you should get cqrlog working with exisiting settings that did work before. Then you could check Hamlib version. If you have installed wsjt-x you actually have 2 versions. If there is difference in version use higest. Should be over 3. In case of using rigctl-wsjtx/rigctld-wsjtx you have to change the filename of "path to rigctld" in cqrlog preferences. You need, and should use, only one instance of rigctld. It is bit hard to pinpoint your problem "as remote". But if n1mm logger works with windows side using same hardware we can assume that there is no problem at hardware side. Try these first and tell what you did find out. I tried your suggestions above and still have the same issue. Here are a few extra details. I tried to download, compile and install WSJT-X 2.0 from K1JT's web page. Since I use Linux Mint and there is no install package available yet for version 2.0 (AMD64), this is my only option. I got most of the way compiling and installing while adding any missing library and developer files along the way, until I got one that Synaptic Package Manager could not find or install. At that point, I just quit my attempt to install WSJT-X 2.0. I know they will work on my machine (both CQRLog 2.3.0(001) and WSJT-X 2.0), because I had them running under Mint 19.1 - but I also had issues with Evolution email not running correctly on Mint version 19.1 (could not receive any messages, but could send without any problem at all), that I downgraded my OS and did a fresh, new install of Mint version 18.3. The other programs seem to behave correctly now running Mint 18.3, but CQRLog can't communicate with the radio, but did work just fine with Mint 19.1.
Who is using my serial port? The ONLY thing that appears to work is the S-Meter. Is changes appropriately as I tune in loud or quiet stations on the actual radio. No frequency display and no other function appear to work. Then I quit GRIG. Is there something wrong with my path to rigctrld? I did notice one new thing I didn't see previously- not related to GRIG testing. The CAT light blinks three times on the radio, but still won't read the radio frequency. I can repeat this over and over with the same results. I'm getting VERY frustrated. I have blown a TON of time playing around to get it working. Any more ideas? The first numbers on each line are different now, because I quit out of CQRLog and started a new session and that changed the PID numbers? First 3 items might be worth of try. We start with timeout. No matter what I tried, I just could not make this work properly. I finally wiped out my Linux Mint 18.3 partition and swap space, reformatted the partition and reinstalled Mint 19.1 - After a few minutes of setup and configuration with CQRLog, I had everything working once again. The reason I went back to Mint 18.3 was because I just could not get Evolution or Thunderbird to receive ANY email - but I could always send no problem. That turned out to be a NSS Network Security file that needed to be installed on Mint 19.1 - because my local internet provider, COMCAST had a compatibility issue with something in LM 19.1 and when Mint 19.1 was released, this updated file was not originally included. It took quite a bit of searching to figure this one out. Now that I'm back on Mint 19.1 - I've got CQRLog and WSJT-X working properly. They are talking to each other and the radio as well. Evolution works now and even my old HP laser printer got the latest driver installed and I can print also - I'm happy. Now I've got to figure out how to get fldigi up and running AND talking to the radio. Thanks again for all your help and assistance - I appreciate it very much. Some words there of fldigi, too. All you have to find by yourself is how to make audio settings properly for fldigi. Everything else should be found from those links.